The Robocomp workspace is for those who are developing components rather than the framework itself. The main advantage of having a workspace is that it will make the work-flow much easier. Workspace basically organizes the development. 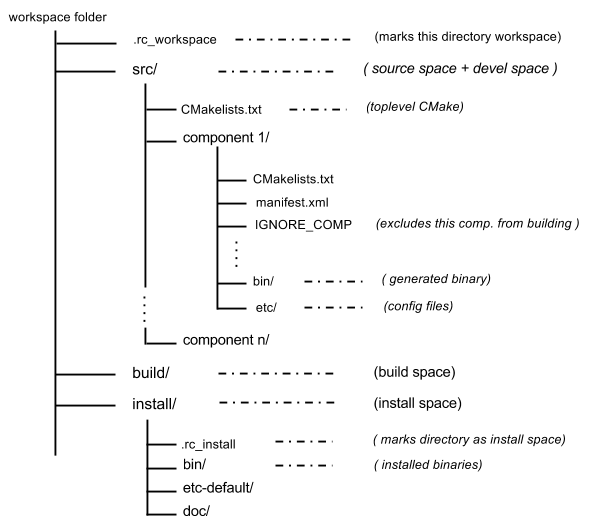 For example, currently for building or running a component you have to go to its directory, create a build directory and then use cmake, while by using workspace and build tools you could achieve the same in a single command. I have started the workspace model design keeping in mind the following points. Referring to other similar workspace models i came up with the following model. ###Workspace The workspace is the folder inside which you are going to be actively developing components. Keeping things in a folder with connected development helps keep separation of development models. In simple words, a workspace can be thought of as a group different components, for example Robocomp has some default components, you may as well create some components so in this case you Robocomp’s components can be in a workspace while your components in another. The config file in ~/.config/RoboComp/rc_worksapce.config maintains a list of all the registered workspaces. ###Source space The source space (a folder inside workspace) contains the source code of all the components in the workspace or this is where you will be developing. The source space is the folder where build tools will look for components. This folder is easily identified as it is where the toplevel.cmake is linked Robocomp installed folder and the name src. Each component should be in a direct subdirectory. If the directory contains a file named IGNORE_COMP the component will be ignored while building the workspace. ###Build Space The build space is the folder in which cmake is invoked and generates artifacts such as the CMakeCache. This need not be a direct sub directory of workspace, it can be any where. This is basically an build directory of all the components. ###Development Space The development space is where build system generates the binaries and config files which are executable before installation.It will have a septate directory for each components. Each component directory contains a folder bin which has the build binaries and a etc directory which contain config files. This should be a direct subdirectory of workspace. Currently the devel space is merged with the source space as you can seen in the layout graph. ###Install Space This is the default directory in to which the components in current workspace will get installed along with generated docs. This directory contains a file named .rc_install which marks this as an install space. Please note that the robocomp install path /opt/robocomp is also an install space by default.